During my first year at Penn State’s Wilkes-Barre campus, I took a physical education class called orienteering. The PSU Wilkes-Barre campus is located near Lake Lehman, PA in a rural, wooded area surrounded by fields and farms. 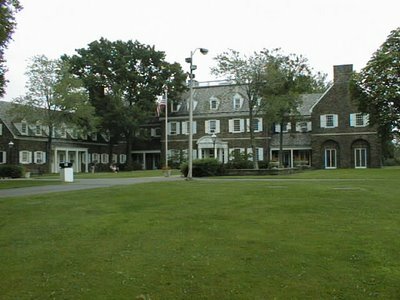 The main building on the campus, called the Hayfield House, was previously a country estate that has been converted into classrooms and offices. The campus is visually breathtaking. The orienteering class required us to use a topographic map and a compass to find a series of flags hidden in the surrounding woods and copy down numbers from them. It was essentially a timed race to see who would find them all and get back to the starting point in the shortest time. It was great exercise, because you covered a lot of terrain in a short time and it had an element of fun to it because you had to think at the same time you were running. Plus, it was all outdoors in a beautiful setting. I still have many fond memories of exploring the countryside around the PSU W-B campus during that class. A few weeks ago during one of our regular neighborhood walks, Terri and I found a couple looking for something using a GPS. I asked them if they were geocaching and they told me they were attempting to find their very first geocache. I had heard about geocaching a few years ago from my friend Kyle, but I had never seen anyone doing it. We helped them for a few minutes, but we didn’t find the cache. GPS units are accurate to about 30 feet, and so it can sometimes be a challenge to find a small geocache, especially if it is well concealed. I learned later from a geocaching website that they eventually located it. It was knowing that they found it that convinced me to give it a try. GPS signals were not always so accurate. Or, I should say, they were not so accurate for civilian GPS receivers. At one time, civilian GPS receivers were only accurate to about 300 feet. The military intentionally added random noise to the GPS signal which only military receivers could remove. On May 1st, 2000, the Clinton administration turned off this random noise, called ‘selective availability’, and over night civilian receivers had their accuracy improved 10 fold. The removal of SA along with the availability of inexpensive handheld GPS receivers and geocaching websites has made geocaching possible. The brief description of geocaching is that someone hides a cache, which is usually a weatherproof container. The cache can be as small as a bullet-sized container or as large as a metal ammo box. The person who hides it posts the container’s GPS coordinates on a website that contains a database of geocaches. The first and largest of these websites is geocaching.com which was started in 2000. It contains the locations of more than 500,000 caches around the world. The person who hides the cache includes a ‘log book’ in it to let those who find it log their username along with the date and a comment. In the small containers like the ever popular 35 mm film canisters, (which are usually covered with camouflage tape), the log is just a small scroll rolled up inside. Some of the caches contain trinkets and, if you’re so inclined, you can take a trinket and leave one of your own. There are also some special serialized tags and coins that are unique to geocaching that you can move from cache to cache and the website can keep track of the object’s whereabouts. Each cache has a unique identifier that starts with the letters ‘GC’. The subsequent characters are assigned by the website at the time the cache is registered. The person hiding the cache usually gives it a clever name and possibly a clue to help locate it. When you set up an account on geocaching.com, you select a unique user ID and you are able to log your discoveries of the geocaches. The geocaching.com website accounts are free, but you can also get a paid account for $3/month that has more features. The website allows you to download the cache coordinates to your GPS which is a great convenience. I downloaded a free program called EasyGPS and that will take a file of geocache locations and put them on my Garmin eMap GPS. You can enter the coordinates by hand too, which is what I did for the first few caches, but it takes much more time to do that and can be a source of error. A screen shot of EasyGPS along with a route I uploaded from the GPS on a recent bicycle ride. Click on the image to get a full screen version. Inside the city of Greeley, CO which has a population of around 87,000 people, there are more than 70 caches hidden. Some of them are elaborate ‘multicaches’ which have clues in them so that you may have to find 3 or 4 caches before you can find the coordinates to the main cache. Some even have quizzes based on subjects like math or history that makes finding the final cache that much more challenging. Within a 10 mile radius of my home, there are nearly 200 geocaches hidden. Terri and I have been looking for caches lately and we’ve managed to find 14 just in the area where we take our regular walks. I’ve put a GPS handlebar mount on my bicycle and now that we’ve found most of the caches within easy walking distance of our house, I’ve been planning to venture out to find the more of them on the bicycle and to get some exercise in the process. This entry was posted in misc, technology by Lee Devlin. Bookmark the permalink. The ammo boxes themselves are not interesting, but they are among the largest of the cache containers you’ll find, so you can fit a lot of things inside them. Ammo boxes are cheap, around $4-$5 each for army surplus cans and they are rugged and weatherproof. The problem with them is that they are hard to hide, so they need to be placed off the path so that a muggler won’t find it and take it. A cheap GPS receiver would be the best way to go for starting out, such as a used one. The emap I use regularly shows up on eBay for $60 or less and an old eTrex would work just as well and cost around the same or less. It would be good if you could get a programmer cable with it too to download the coordinates from a PC. I would have expected a PDA in combination with a CF GPS to be a great setup for this hobby but I only found one person using a PDA along with some software called BackcountryNavigator. Car navigation programs like TomTom are nearly useless for geocaching. The other uses for a PDAs are for ‘paperless’ caching which I’ll attempt to explain in another posting. Basically, it means downloading the information about the cache, like its size, and any hints from others who have found it. That becomes very important information when you’re trying to locate a cache and don’t know what you’re looking for, like whether it’s a large container, or something as small as a bullet container held in place with a magnet. I may just get a cheap RX just to track my distance, and where I have gone. I do have a cyclometer, but it doesn’t do quite as much as a GPS would.